North Korea has not abandoned its nuclear and missile programs, despite this year's earlier diplomatic breakthroughs and destruction of test sites, Reuters reports, citing a confidential UN paper. The leaked report is said to be a six-month review by independent experts monitoring the implementation of United Nations sanctions on North Korea, and was submitted to the relevant UN committee late on Friday. The paper, as cited by Reuters, alleges that Pyongyang has not abandoned its pursuit of missile and nuclear programs. It is also violating UN sanctions by exporting weapons to a "range of Middle East [and] African states," including to the Houthi rebels fighting against Saudi Arabia in Yemen, and has shipped coal, petroleum and textile products, all made illicit by the sanctions regime. The report comes two months after North Korea made an unprecedented gesture by demolishing its only nuclear test site at Punggye-ri, while inviting a group of international journalists to witness it. An RT crew was at the scene. 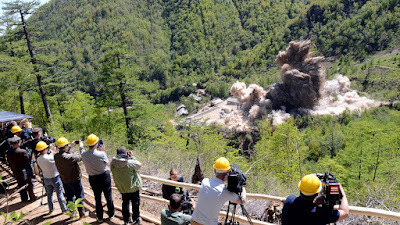 With the UN report covering six months, the excerpts quoted by Reuters do not clarify whether Pyongyang's alleged nuclear- and missile-related activities came before or after the demolition, nor do they specify the evidence used to establish the fact of the violations. North Korean leader Kim Jong-un indicated he was willing to denuclearize at an April meeting with his South Korean counterpart Moon Jae-in. The credit for this pledge was claimed by US President Donald Trump and his administration, and in June Trump himself went to meet Kim in an unprecedented personal visit, where Kim confirmed his commitment. Despite the diplomatic breakthroughs, the US says the sanctions, which have been gradually choking off every venue of export and import for North Korea, must remain in place until Kim gives up all of his nukes. In July, Secretary of State Mike Pompeo said it should take 2.5 years for that to happen. In a later interview, he said it was Kim's decision to set an actual timeline for the process. Earlier this week, several media reports, citing anonymous officials and unspecified intelligence reports, claimed there was renewed activity at a North Korean missile factory, and that Pyongyang was making "one or two" new intercontinental ballistic missiles.